What Are the Fiber Optic Cable Advantages and Disadvantages? What are the fiber optic cable advantages and disadvantages? 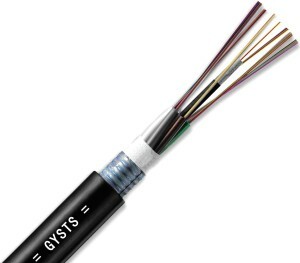 An optical fiber or fiber optic cable is a flexible, transparent fiber made by drawing glass, which are used most often as a means to transmit light between the two ends of the fiber and find wide usage in fiber-optic communications, where they permit transmission over longer distances and at higher bandwidths (data rates) than wire cables. 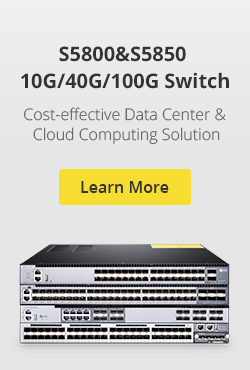 Whether should I use optical fiber cables in my network? Single mode fiber or multimode fiber? Don’t worry, read through this post to learn both fiber optic cable advantages and disadvantages and then make a right choice. Fiber optic cables have a much greater bandwidth than metal cables. The amount of information that can be transmitted per unit time of fiber over other transmission media is its most significant advantage. An optical fiber offers low power loss, which allows for longer transmission distances. In comparison to copper, in a network, the longest recommended copper distance is 100m while with fiber, it is 2km. Fiber optic cables are immune to electromagnetic interference. 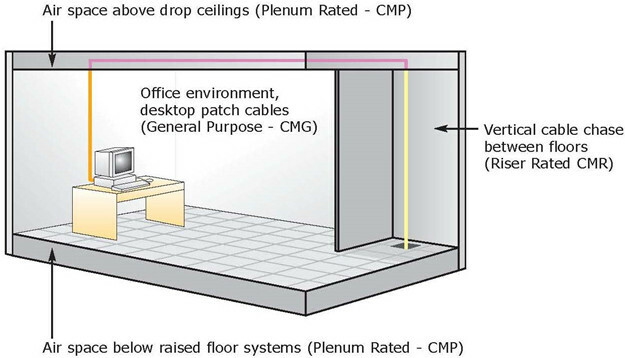 It can also be run in electrically noisy environments without concern as electrical noise will not affect fiber. In comparison to copper, a fiber optic cable has nearly 4.5 times as much capacity as the wire cable has and a cross sectional area that is 30 times less. Fiber optic cables are much thinner and lighter than metal wires. They also occupy less space with cables of the same information capacity. Lighter weight makes fiber easier to install. Optical fibers are difficult to tap. As they do not radiate electromagnetic energy, emissions cannot be intercepted. As physically tapping the fiber takes great skill to do undetected, fiber is the most secure medium available for carrying sensitive data. 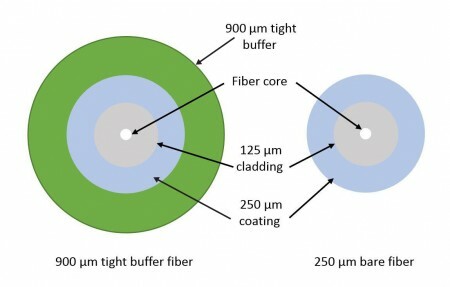 An optical fiber has greater tensile strength than copper or steel fibers of the same diameter. It is flexible, bends easily and resists most corrosive elements that attack copper cable. The raw materials for glass are plentiful, unlike copper. This means glass can be made more cheaply than copper. The optical fibers are difficult to splice, and there are loss of the light in the fiber due to scattering. They have limited physical arc of cables. If you bend them too much, they will break. The optical fibers are more expensive to install, and they have to be installed by the specialists. They are not as robust as the wires. Special test equipment is often required to the optical fiber. The fiber optic cable is a small and compact cable, and it is highly susceptible to becoming cut or damaged during installation or construction activities. The fiber optic cables can provide tremendous data transmission capabilities. So, when the fiber optic cabling is chosen as the transmission medium, it is necessary to address restoration, backup and survivability. The transmission on the optical fiber requires repeating at distance intervals. 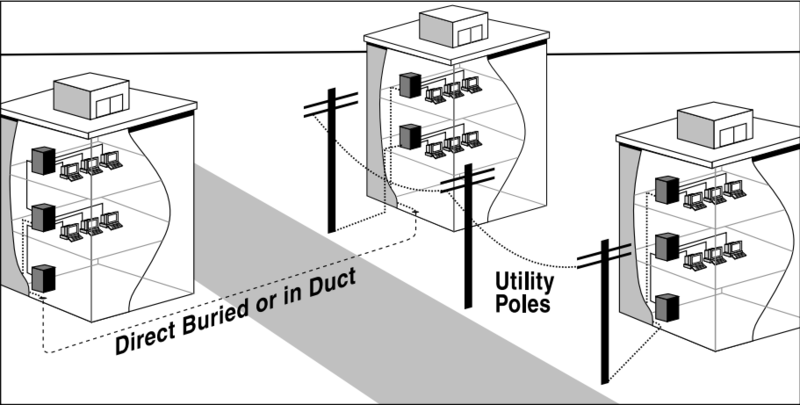 The fibers can be broken or have transmission losses when wrapped around curves of only a few centimeters radius. Fiber optic cable has both advantages and disadvantages. However, in the long run, optical fiber will replace copper. In today’s network, fiber optic cable becomes more popular than before and is widely used. FS.COM, as a leading optics supplier, provides all kinds of optical fiber cables with high quality and low price for your option. Related Article: What Are the Most Popular Fiber Optic Cable Types? This entry was posted in Bulk Fiber Cables and tagged Advantages of Optical Fiber Cable, Disadvantages of Optical Fiber Cable, fiber optic cable, optical fiber on February 8, 2017 by Alice.Gui. Armored Fiber Optic Cable, just as the name implies, is that there is a layer of additional protective metal armoring of the fiber optic cable. Armored fiber cable plays a very important role in long-distance line of fiber optic cable. A layer of metal armoring in the scarf-skin of fiber optic cable protects the fiber core from rodent, moist and erosion. According to the place of use, there are indoor armored fiber optic cables and outdoor armored fiber optic cables. Indoor armored fiber optic cable is mainly used in interior, so it must be flexible and can be installed in the corner and some narrow places. 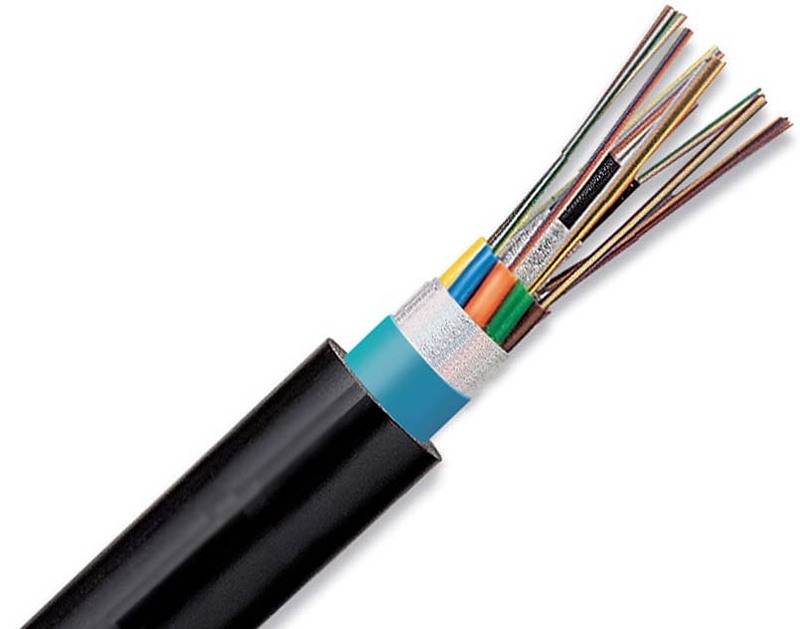 Besides, indoor armored fiber optic cable experiences less temperature and mechanical stress, but they have to be fire retardant, emit a low level of smoke in case of burning. And indoor armored fiber cables must allow a small bend radius to make them be amendable to vertical installation and handle easily. Indoor armored fiber optic cable can be divided into simplex armored fiber optic cable and duplex armored fiber optic cable. 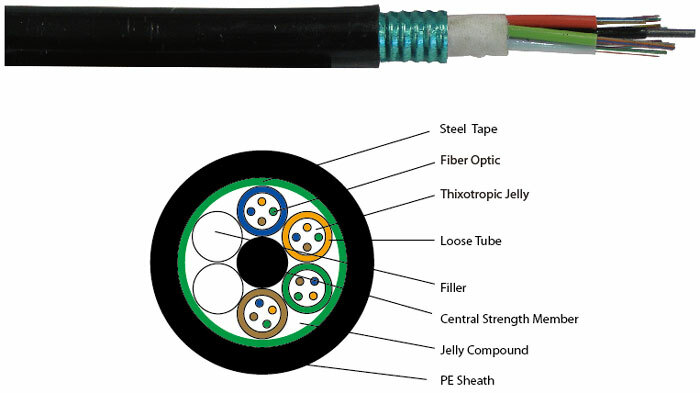 The main difference is that simplex armored fiber optic cable is the cable that not contains stainless steel wire woven layer, and duplex armored fiber optic cable is the cable that contains stainless steel hose and stainless steel wire woven which are of compressive property, resistance to deflection, rodent resistance, anti-torque and so on. Outdoor armored fiber optic cables are made to protect the optical fiber to operate safely in complicated outdoor environment. 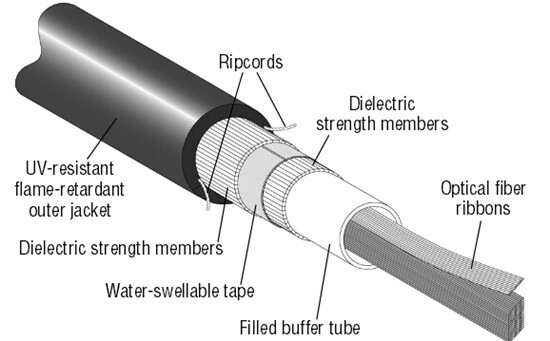 Most armored outdoor fiber cables are loose buffer design, with the strengthen member in the middle of the whole cable, the loose tubes surround the central strength member. Outdoor armored fiber optic cable can be divided into light armored fiber optic cable and heavy armored fiber optic cable. Light armored fiber optic cable is with steel tape and aluminium tape which can strengthen rodent protection. Heavy armored fiber optic cable is equipped with a circle of steel wire, and usually used in riverbed and seabed. There are two installation methods of armored fiber optic cable. One is buried directly in the ground, and the other is aerial optical cable. For direct burial fiber cable, armored fiber optic cable is in the position to resist external mechanical damage, prevent erosion and resist rodent. In addition, because of different soil and environment, the depth of burying under the ground is about between 0.8m-1.2m. On the other hand, aerial optical cable is the optical cable that hanging on the pole. This kind of installation way of armored fiber optic cable can prevent fiber core from any kind of severe environment, such as typhoon, ice, and people or animals. Aerial armored optical cable mostly uses central loose tube armored fiber optic cable (GYXTW) and stranded loose tube armored fiber optic cable (GYTA). The features of GYXTW are that can contain up to 12 fiber cores, the loose tube is centrally situated with good excess length and minimizes the influence of lateral crush, and double wire as strength member provides excellent strain performance. GYTA is suitable for installation for long haul communication and LANs, especially suitable for the situation of high requirements of moisture resistance. GYTA is with compact structure; the cable jacket is made of strong Polyethylene. This armored fiber optic cable features the good mechanical and temperature performance. GYTA is also with high strength loose tube that is hydrolysis resistant and the optical cable filling materials ensure high reliability, its APL makes the cable crush resistant and moisture proof. The GYTA fiber optic cable is available from 2 cores to 144 cores. This entry was posted in Bulk Fiber Cables and tagged fiber optic cable, Indoor armored fiber optic cable, Outdoor armored fiber optic cable on April 10, 2015 by Amelia.Liu. Optical fiber cables for indoor cabling are used for the construction of horizontal subsystem and SCS building backbone cabling subsytems. They differ form cables used for outdoor cabling by two key parameters. 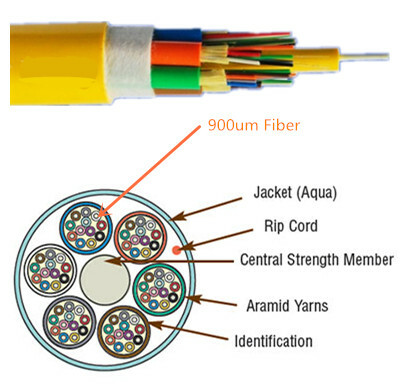 Indoor fiber optic cable is tight buffer design, usually they consist of the following components inside the cable, the FRP which is non-metallic strengthen member, the tight buffer optical fiber, the Kevlar which is used to further strength the cable structure, making it resist high tension, and the cable outer jacket. The trend is to use LSZH or other RoHS compliant PVC materials to make the cable jacket; this will help protect the environment and the health of the end users. Although thes categories overlap, they represent the common ways of referring to fibers. Figure 7-5 shows cross sections of several typcial cables types. A simplex fiber cable consists of a single strand of glass of plastic fiber. Simplex fiber is most often used where only a single transmit and/or receive line is required between devices or when a multiplex data signal is used (bi-directional communication over a single fiber). 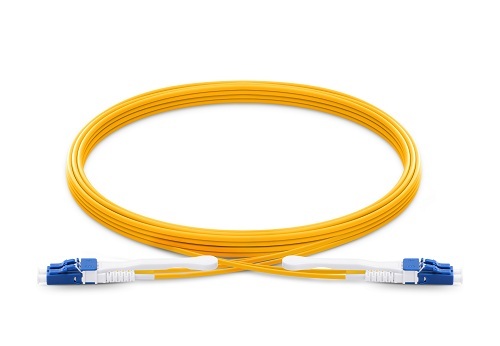 A duplex fiber cable consists of two strands of glass or plastic fiber. Typically found in a “zipcord” construction format, this cable is most often used for duplex communication between devices where a separate transmit and receive are required. Duplex cable is used instead of two simplex cables for aesthetics and convenience. It is easier to handle a single duplex cable, there is less chance of the two channels becoming confused, and the appearance is more pleasing. Remember, the power cord for your lamp is a duplex cable that could eaily be two separate wires. Does a single duplex cord in the lamp not make better sense? The same reasoning prevails with fiber optic cables. The loose tube variety contains one or more hard buffer tubes, which house between 1 and 12 coated fibers. The hard buffer tubes are also filled with a gel to provide vibration and moisture protection for the fibers. The fibers lie loosely in the tubes, which are wound into the cable in a reversing helical fashion and are actually longer than the outer sheath of the cable. This arrangement allows for a small amount of stretch in the outer sheath when installing the cable. Loose tube cable is used most often in OSP construction because it is designed for a tough outdorr environment use. See Figure-1 for the physical make-up of a typical loose tube cable. Breakout cables have several individual simplex cables inside an outer jacket. The breakout cables shown in Figure 2 use two dielectric fillers to keep the cables positioned, while a Mylar wrap surrounds the cables/fillers. The outer jacket includes a ripcord to make its removal fast and easy. The point of the breakout cable is to allow the cable subunits inside to be exposed easily to whatever length is needed. Breakout cables are typically available with two or four fibers, although larger cables also find use. Ribbon cable uses a number of fibers side by side in a single jacket. Originally, Ribbon fiber cable was used for outdoor cables (see Figure 3). Today they also find use in premises cabling and computer applications. The cables, typically with up to 12 fibers, offer a very small cross section. They are used to connect equipment within cabinets, in network applications, and for computer data centers. 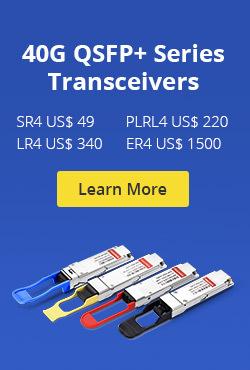 In addtion, they are comatible with multifiber array connectors. Ribbon cables are available in both multimode and single-mode versions. This entry was posted in Bulk Fiber Cables and tagged Breakout Cables, Duplex cables, fiber optic cable, Indoor Cables, Loose Tube Cables, Ribbon Cables, Simplex cables on April 7, 2015 by Amelia.Liu. Armored fiber optic cable consists of a cable surrounded by a steel or aluminum jacket which is then covered with a polyethylence jacket to protect it from moisture and abrasion. It may be run aerially, installed in ducts, or placed in underground enclosures with special protection from dirt and clay intrusion. Armored fiber optic cable is often installed in a network for added mechanical protection. Two armored fiber cable types exist: interlocking and corrugated. Interlocking armor is an aluminum armor that is helically wrapped around the cable and found in indoor and indoor/outdoor cables. It offers ruggedness and superior crush resistance. Corrugated armor is a coated steel tape folded around the cable longitudinally. It is found in outdoor cables and offers extra mechanical and rodent protection. Armored fiber cable can be divided into indoor armored fiber cable and outdoor armored fiber cable. With the fast development of fiber optic communication technology and the trend of FTTX, indoor fiber optic cables are more and more required to be installed between and inside buildings. 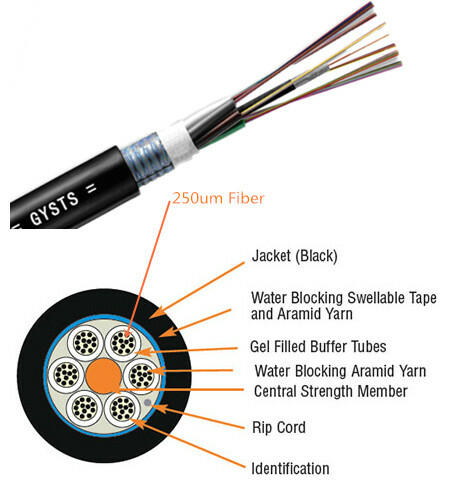 Typical indoor armored fiber cable types include GJFJV, GJFJZY, GJFJBV, GJFJBZY, GJFDBV and GJFDBZY. Compared with outdoor use fiber cable, indoor fiber cable experiences less temperature and mechanical stress, but they have to be fire retardant, emit a low level of smoke in case of burning. And indoor armored fiber optic cable allows a small bend radius to make them be amendable to vertical installation and handle easily. Outdoor armored fiber cable is made to protect the optical fiber to operate safely in complicated outdoor environment. Most Outdoor Armored fiber cables are loose buffer design, with the strengthen member in the middle of the whole cable, the loose tubes surround the central strength member. Inside the loose tube there is waterproof gel filled, whole cable materials used and gels inside cable between the different components (not only inside loose tube) will help make the whole cable resist of water. Armored fiber cable is used in direct buried outside plant applications where a rugged cable is needed and/or for rodent resistance. Armored fiber optic cable withstands crush loads well, for example in rocky soil, often necessary for direct burial applications. Cable installed by direct burial in areas where rodents are a problem usually have metal armoring between two jackets to prevent rodent penetration. Another application for armored fiber cable is in data centers, where cables are installed under the floor and one worries about the fiber cable being crushed. Indoor armored fiber optic cables may have nonmetallic armor. 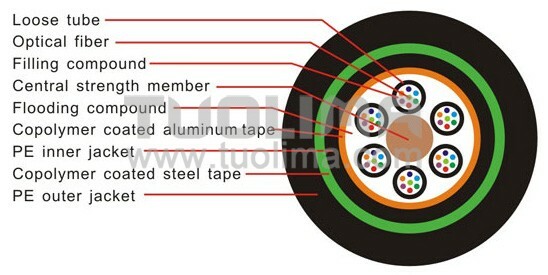 Metallic armored fiber cable is conductive, so it must be grounded properly. As with other fiber optic components, there are different names or meanings used. “Armor” in some companies’ jargon denotes a twisted heavy wire rope type cable surrounding the entire poly cable sheath/jacket. Single or double armor (two opposite ply layers of the steel wire) is typically used underwater near shore and shoals. Inner metallic sheath members of aluminum and/or copper are used for strength and for buried cable locating with a tone set. This entry was posted in Bulk Fiber Cables and tagged armored fiber cable, Armored fiber optic cable, indoor armored cable, indoor fiber cable, outdoor armored fiber cable on April 2, 2015 by Amelia.Liu.